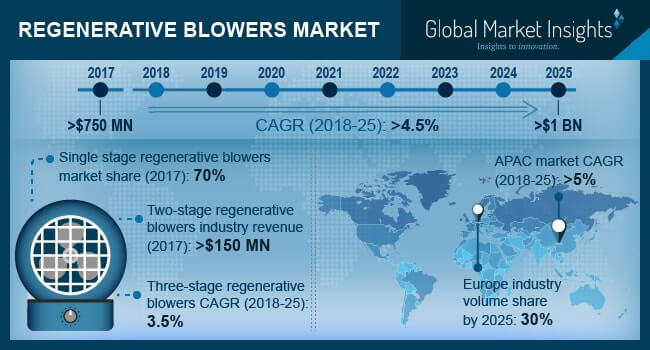 Regenerative Blower Market size will surpass USD 1 billion by 2025; according to a new research report by Global Market Insights, Inc.
Growth in chemical industry in developed economies of North America due to upsurge in demand for pharma, agrochemical and other specialty products across the region will be a major boost for regenerative blower market demand in the coming years. Global chemical sales accounted for USD 3.84 trillion in 2015, of which North America accounted for around 16.5% market share. This will be a key contributing factor for the product demand positively in the region as the blowers are used for transferring the powders, light solids, foam along with chemicals, etc. Increase in domestic oil production in North America region will boost the oil & gas sector growth by 2025 due to the supportive initiatives taken by the U.S. government to expand shale oil & gas production. The above-mentioned trends are expected to follow and thus will drive regenerative blower market in the forecast spell. Blowers are used for loading granules, pellets and other materials in hoppers, and form air layers to facilitate material loading. Development in food & beverage industry in Asia Pacific, with rise in individual purchasing power, change in dietary habits, increasing demand for ready-to-eat food, population growth, etc. In Asia Pacific, food & beverage industry is expected to grow with CAGR of around 4.5% from 2018 to 2025. This will subsequently boost the sales growth of regenerative blowers in the forecast timeframe as the product is used for drying & sealing the bottles, cans and are also used for handling fragile food items such as eggs and other edible items. Based on stage, the industry is segregated into single, two and three stages. Among these three stage blowers will show a decent growth with CAGR around 3.5% in future as these pumps use three impellers and generate high air flows at lower level of pressure. This property of the product makes them suitable for various applications in textile, paper & printing, manufacturing and pharmaceutical industries. Chemical industry shows a positive growth in the end-user segment with CAGR close to 4.5%. Increasing demand for agrochemicals, specialty chemicals and petrochemicals due to initiatives taken by government of emerging economies to support industrialization coupled with rising agricultural income will boost growth of chemical industry and this in turn will have positive impact on product sales in forecast period. On the basis of region, India regenerative blower industry will likely to witness CAGR close to 5.5% over the forecast years. Increasing population rate coupled with growing water pollution issues will boost wastewater treatment and food & beverage industry in India, thus impacting product demand positively over the forecast timeframe. Key regenerative blower market players include Hitachi Limited, Gardner Denver, Becker Pump Corporation, Busch LLC, KNB Corporation, Atlantic blowers, Dustcontrol AB, Elektror Airsystems, Airtech Airsystems Ltd., Air Control Industries, The Spencer Turbine Company, FPZ S.p.A. and Chuan Fan Electric Co. Ltd.